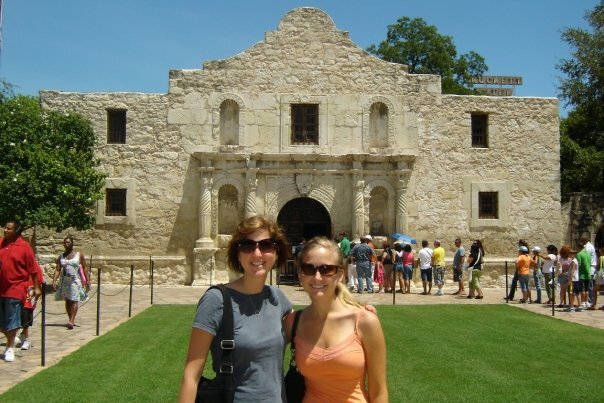 Me and my roommate, Jessica, at the Alamo. I took a road trip with friends last weekend to San Antonio and Austin, where I experienced the Alamo, nightlife on Sixth Street, and the equivalent of a giant Mexican McDonald’s. During our first night in San Antonio we went to Chachuo’s and Chalucci’s, a huge Mexican restaurant that’s open 24 hours a day. The restaurant even has a karaoke bar. If I hadn’t been so tired when we arrived at the restaurant at 12:30 a.m., I would have gotten behind the mic. The next day we went to the Riverwalk and the Alamo. The Alamo is a lot smaller than I thought it would be, and it’s right in the middle of downtown. I expected it to be set back somewhere away from the hustle and bustle of city life. Before heading an hour north to Austin, we went to a barbecue restaurant called The Salt Lick. You have to drive on long, winding roads to get to the restaurant, which is in a little middle-of-nowhere town called Driftwood. I never expected to find such a huge restaurant hidden there among the hills. I’m not a big fan of barbecue, so I mostly ate the pickles and warm bread that came with the main meal, along with some blueberry cobbler and vanilla ice cream for dessert. I enjoyed the atmosphere more than the food. You can bring your own coolers to the restaurant, and you can sit outside and listen to music or sit inside where you’re less likely to keel over from a heat stroke. We headed to Austin after satisfying our barbecue cravings and then went out on Sixth Street, where young club-goers and bar hoppers come out to play. We gravitated toward the bars with live music and rooftop access. I loved walking along the street, which reminded me of Bourbon Street, but with fewer people. While in Austin, we also visited the University of Texas’ campus and toured the Capitol. I’d recommend both. I went to Forth Worth last Friday for a story but still haven’t gotten to experience the downtown life there yet. I hear it’s more authentic than Dallas in terms of its Texas identity: think cowboys, the rodeo, etc. Next on my list of cities to visit: Houston. Haha.. oh man, you moved to Texas and you’re NOT a fan of BBQ? Hopefully all the steers and grills in TX can change that!